The Brown Deer Park Golf Course already had plenty of remarkable history, but now it&apos;s moving into the future as well. Published Aug. 3, 2018 at 11:56 a.m.
As one of Milwaukee County Parks' oldest courses, Brown Deer Park Golf Course has a rich history – one that includes Tiger Woods' professional debut and extends to John Daly and Jack Nicklaus playing the course as well. And while Brown Deer is no longer a site for PGA Tour events, it still hosts stops on the Symetra Tour – and it is a course where major upgrades are being made constantly. Located off Range Line Road in Milwaukee, Brown Deer is an 18-hole, par 71 course with a total yardage of 6,759. The course itself is considered a tournament course – the only one in that category in the Milwaukee County Parks system. As a former site for PGA Tour events and a current site for the Symetra Tour's PHC Classic, the road to the LPGA, Brown Deer Head Golf Professional Andrew Barrett says the course is a must-play for all avid golfers – not only to experience the high-quality Brown Deer offerings, but to experience the history as well. "Brown Deer is a great layout, it's a great peace of land, it's a great location and it has a great history," Barrett said. "It can give you all sorts of challenges – and when you play golf, that's what you want. And Brown Deer has that." The course was designed in 1929 by George Hansen, who designed four other courses in the county system including Whitnall and Currie Park. Since then, however, the course has been modified by other designers – including Madison's own PGA Tour winner Andy North, a Wisconsin Athletic Hall of Fame inductee. While the history of Brown Deer is unmatched, not only in the county but in the state as well, the course has previously been only known for its rich past and not its current status. According to Barrett, they were not known for having the basic amenities that every high-quality course should have such as a nice clubhouse, good food and a decent practice area. However, since his arrival, big changes have occured, and continue to occur, to make it a well-rounded and modern course. "Since I've been here, we have redone the golf shop, cart station area, the roof, and heating and air conditioning," Barrett said. "We did the deck overlooking the ninth hole at the sports bar, we did a road realignment for the practice facility, we painted the whole clubhouse, we have a new kitchen and we redid the hallway into a mini museum. "Brown Deer use to be a course where the practice facility was poor," he continued. "People would drive past us, go to a different driving range to practice, then come here to play golf. Then they would leave to get a bite to eat. This used to be a very one-dimensional course with only one source of revenue and that was green fees. We didn't really tap into the practice facility category, and we didn't really tap into the food and restaurant category." With an updated practice facility now in place – which includes a large putting green, a modern driving range and a short-game area – the clubhouse has a new image. The lack of dining options has been filled as well with a brand new, full-size kitchen and bar in the clubhouse called the Oak and Antler Tavern, featuring a unique sports bar feel with large TVs, a fully stocked bar, a food menu and a patio with a view facing the ninth hole. Items on the menu include the Clubhouse Burger, a Southwest chicken wrap, a bacon cheddar grilled cheese, a strawberry and feta salad, and much more. With the new tavern and kitchen, plus the other new amenities and improvements, Barrett says Brown Deer is broadening their reach. "Now, when people come here, it may not be to golf," he elaborated. "It may be to practice, have a bite to eat and go back to work. So now we are hitting on different revenue categories and that is what our loyal customers want. They want a place where you can do a wide variety of things." Jon Canavan, Golf and Recreation Turn Manager for Milwaukee County Parks, said he too is very pleased with the way Brown Deer is turning its image around and becoming a modern course with much to offer. "Brown Deer has a lot of momentum going forward," Canavan said. "It is becoming a local destination for golfers. It's a gem for Milwaukee and a place that is affordable yet very high in quality." 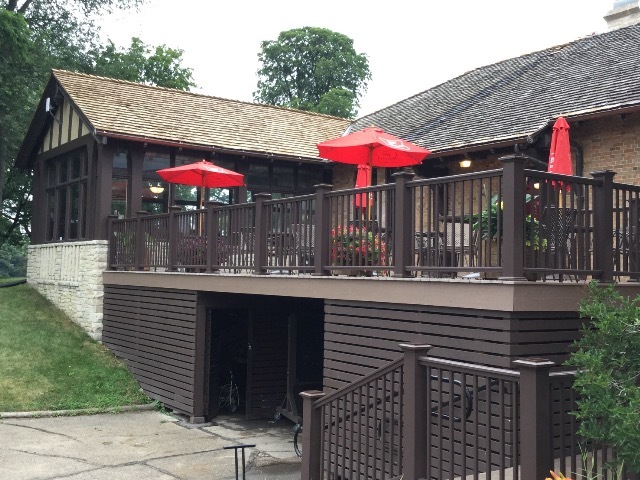 Canavan also said that, with the new kitchen and tavern, the Brown Deer clubhouse will be able to cater events – such as weddings and parties – in the ballroom of the clubhouse, which was previously the old dining area. "People know of Brown Deer and maybe they have played it before, but they should come play it now and see the difference," Canavan noted. Perhaps one of the more unique new features of the clubhouse is the hallway. What was once a dreary hallway with nothing to look at is now a display of the history of Brown Deer. The pieces in the hallway include newspaper cutouts of when John Daly played the course, Corey Pavin's historic scorecard from shooting the lowest nine holes in PGA history with a score of 26, articles from when Tiger Woods began his career and much more. 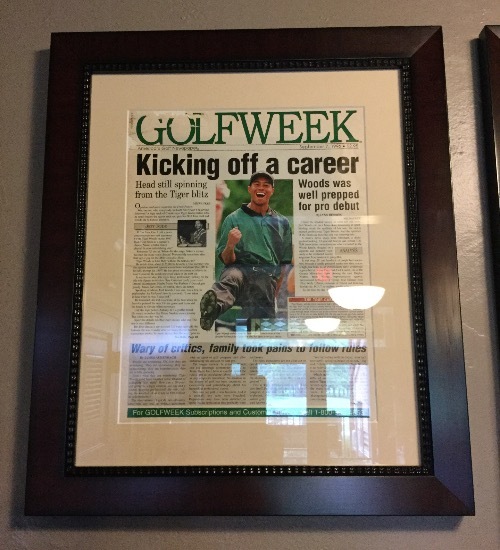 "A lot of people see the artwork that we put in the hallway and they remember that moment and they are so proud to say, 'I was here the day Tiger teed off for the first time,' or when he hit the hole-in-one on the fourteenth hole," Barrett said. "It is a great piece of history to expose – and now when people go into the hallway, they are able to bring those memories back. I want those memories to be front and center and to express how awesome it was to have Tiger Woods here." As for the course itself, Barrett said the conditions are as close to perfect as they can be, with the greens playing fast, the bunkers placed well and the water hazards all adding to the fun challenge Brown Deer brings. "The course right now is in phenomenal shape," Barrett said "I get a lot of people who come off the course and come into my office and tell me, 'Andy, this place is awesome.' And I love hearing that. This place has the closest feeling to a country club that a municipality could have. We have come a long way and this is just a different venue than it was five to ten years ago. It's much better." Brown Deer Golf Course Superintendent Tim Wegner credits the course's well-trimmed look to his staff, saying the tactics used to keep the greens at a high level has never changed. But that's just about the only thing that hasn't. "We're starting to see stuff at the golf course, with the renovations to the clubhouse and the road, that I honestly never thought I would have seen during my career," Wegner said. "To see stuff moving along and actually happening is very exciting." Along with keeping an eye on the course and clubhouse, one of Barrett's main jobs is to teach the game of golf as well. Barrett says that he is very flexible with scheduling when it comes to lessons and believes that everyone can learn to play and continue to improve. "It's about getting people better," Barrett said. "It's not a game of perfection; it's a game of getting closer to perfection and more consistent. Everyone can get better. It's all about getting people to go home with a smile by playing good golf." He added it is never too late for anyone to learn to play and that nobody is ever that bad of a player where they can not improve. In fact, improving is a topic that Barrett says he can speak from experience. "I didn't start playing until the middle of high school," Barrett said. "I loved the game, but I was the worst golfer you had ever seen. If I knew how bad I was, I probably would have quit a long time ago." With much determination, Barrett was able to improve his game greatly and was even able to qualify to compete in the 2004 U.S. Bank Championship at Brown Deer. It was an achievement that Barrett said is special to him – especially considering he is now the head pro at the course where he made his PGA debut. However, while Barrett says he has done more than he ever would have thought with his career in golf, he said he is fully committed to putting all his experience into making Brown Deer a course that is constantly improving. "I've had a nice golfing career, but now I'm focused solely on Brown Deer and making it better," he noted. "I believe this is a great platform. 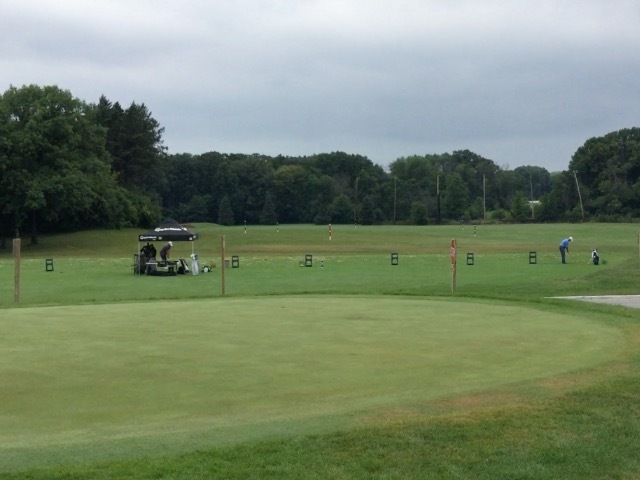 Brown Deer is very important to Wisconsin golf." Be sure to check out the exclusive OnMilwaukee video to see all the latest updates in the clubhouse and to get a walk through of the fifteenth hole with Barrett. And be sure to attend the Symetra Tour's PHC Classic, hosted at the Brown Deer Park Golf Course next weekend.